MORE of Brazil’s forests are now enveloped in fire and smoke than ever before. In a dry El Niño year, the Savannas in the state of Roraima, left parched by the worst drought in history, now face the worst-ever blazes, burning as wide as over five kilometres. Deforestation by miners, ranchers and industrialists have resulted in the loss of over 12.9 per cent of pristine Amazon rainforests. This season, the rains failed to appear. They won’t till April. Meteorologists blame it on the El Niño phenomenon. Fires have spread rapidly and are now totally out of control — destroying arable land, pastures, and forests. The towering infernos and billowing smoke give the Savannas a hellish look. The last rains were around eight months ago. Fire experts believe that until it rains, the fires cannot be contained. Thanks to the dry weather and a booming economy, Brazil’s forests are fast disappearing. In 1996, the government came up with steps to curb deforestation. In 1995, forest destruction peaked and resulted in a loss of 29,000 sq km of forest land. Imprisonment and fines were imposed on the defaulters. As a result, the rate of deforestation fell marginally last year. Estimates suggest that most of the loss to the Amazon forest have been in the past four years. Loggers who earlier cleared east coast forest, have now moved up to the Amazon forests. 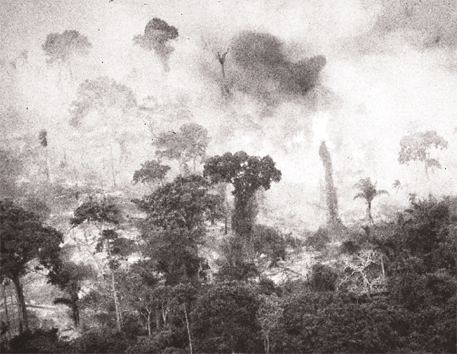 In the 1970s and 1980s the Brazil’s military governments had encouraged deforestation. On January 28 this year, the government unified a host of laws against environmental crimes. However, some previous laws were watered down due to lobbying by loggers, ranchers and industrialists. Scientists compare the Brazilian blaze to the Indonesian forest fires that peaked late last year, spreading smoke across nations. They believe that the Brazilian fires could be worse. According to Brazil’s National Institute for Research in the Amazon, this fire is the worst in Amazon region’s history. The Brazilian government has allocated US $1.7 million for firefighting and relief. Tribes such as the Yanomamis, the Wapixana and the Macuxi, who inhabit this inaccessible thinly populated state, are the worst hit. Their water reserves have dried up. The fires have also killed countless domestic and wild animals. According to government estimates, over 12,000 cattle have died. The Washington Post reports that this number could touch 100,000 if the rains don’t come by. With crops and cattle dying, the Yanomamis are now relying on fishing for their livelihood. Burning of trees to clear forest is a common practice of farmers. Farmers, loggers and miners are migrating to this mineral rich land. As it happened in Indonesia, these practices seem to have contributed to the fire as did logging. Satellite pictures, released recently, show that huge tracts of the Amazon rainforest are being destroyed by burning and logging. “The damage to the environment is incalculable,” says a researcher of the Institute, Reinaldo Barbosa, quoted in the Post. “It will take at least 100 years for the forest to recuperate,” he said. He estimates that a combined area of 15,000 square miles — 12,500 of Savannas and 2,500 of forest — has been affected. About 12 to 16 per cent of the Roraima state’s vegetation has been burnt or dried up. According to a Yanomami myth: Gods buried minerals deep in the heart of Earth to make the soil rich and strong. If you remove them, poisonous smoke would arise to cover the Earth. The biggest ever fires that rage in the northern Amazonian forests of Brazil and Savannas could be apocalyptic for one of the most primitive people on Earth.